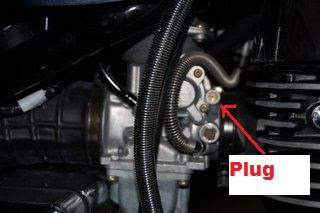 PLEASE NOTE: the idle screw plug modifications described only apply to SOME country versions - check the pics below. Not all Savages have the plug. " A stock S40 Boulevard is tuned very lean to meet EPA emissions standards. It also pretty much guarantees a significant amount of afterfiring (or backfiring to most people). 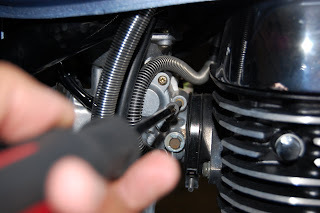 To correct the afterfire problem, you'll have to remove the brass plug that Suzuki installs to cover the idle mixture screw. The process is very simple and the results are remarkable. 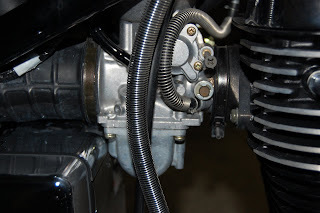 In the picture above at about the 2 o'clock position on the right side of the carb you'll see a small brass plug. 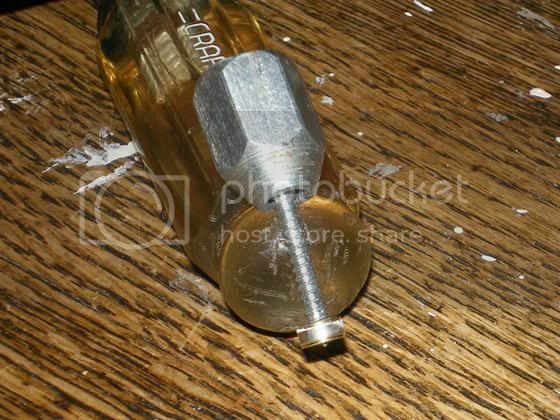 What you want to do is remove this plug to expose the idle mixture screw beneath it. Do not confuse this with the idle "speed" screw, which sets the idle rpm's higher. When you adjust the idle speed screw you're making a lean fuel mix idle faster. When you adjust the idle "mixture", you're going to add more fuel to the mix, thereby running more "rich". The way you'll remove the plug is to drill a shallow pilot hole, then drive in a screw for a few turns until it wedges in firmly, and then you'll pull out the screw and the plug together. Step 1: Drill the pilot hole with a 3/32" bit. Be carefull to limit the depth to about 1/8"-3/16" deep. You can wrap tape around your bit at the desired depth so you don't end up drilling thru the idle mix screw. 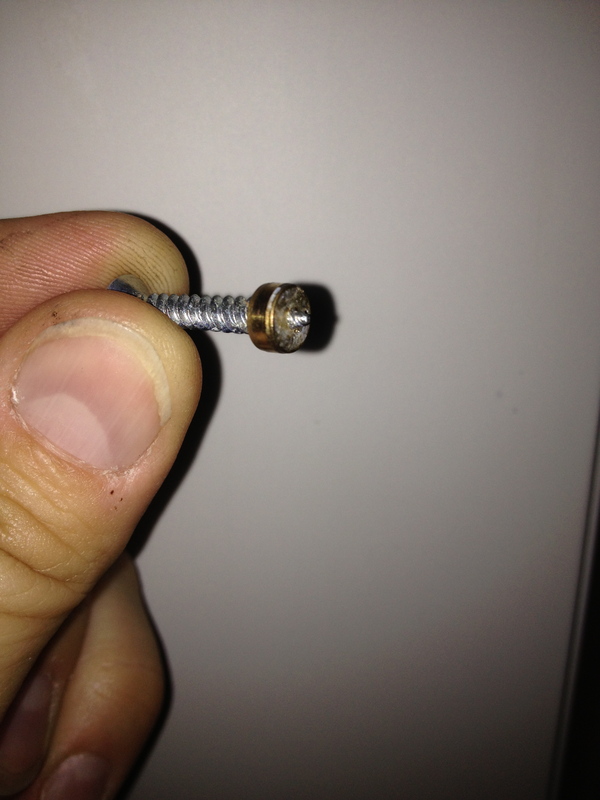 Step 2: Screw a fine drywall screw into the pilot hole until it is firmly gripping the brass. You do not usually need more than a full turn or two. Step 3: Grab the screw with a pair of vice grips and pull it out. Takes a little effort. 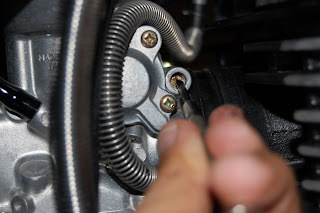 Step 4: When the plug is removed, clean out any brass shavings that may remain inside, and then give the exposed idle mixture screw a half-turn counter-clockwise . A half turn works well for most people as a starting point. You may need more if you are at a different altitude, temp or humidity. If you have a tachometer, you can fine tune it further by adjusting the screw until you reach max rpms. Turn it 1/4 turn at a time, wait 20 seconds and see if the revs go up. If they do, give it another 1/4 turn, wait 20 secs and repeat until the revs drop. Turn it back as needed to hit the peak. Also, after-firing can also be aggravated by air inleakage at the exhaust header, Be sure to check that your header nuts are tight before you test out the new setting. You're set. You should see a big reduction in afterfiring and for normal driving you should not expect a penalty in mpg. If you're idling in stop and go traffic a lot, it may reduce your fuel efficiency. One last thought... it is possible that you may have to adjust your idle SPEED screw, on the other side of your carb, after this mod. I had mine tuned to idle at 1000 rpms with the leaner fuel mix. After I richened the mix the bike cut off at idle when I went for a test ride. So if this happens to you, don't go in there and adjust your fuel mixture first. Just crank up the idle speed a bit and you should be fine. I thought I should share this with all the members here as I have gleaned so much information from this site and have read so many posts of the butchery of this little plug and the adjustment screw behind its brassy stubbornness. Well, after reading the above post and following the instructions to the letter, I thought I was going to die. The death vice-grip trick just was not going to work. Afraid that I was going to rip the carb off the bike roots and all, or pop a gut -- I was resigned to the fact that my first two attempts were not worth my tinker’s damn. 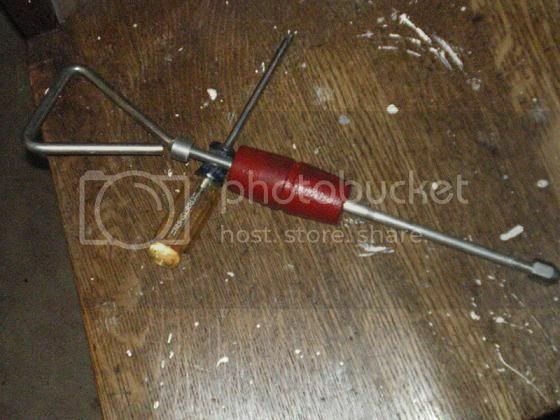 I lamented my predicament down at the coffee shop the next morning and one of my fellow coffee addict friends said I should try his body dent puller tool. Needless to say, after the first half-hearted pull and next one rewarded me with the desired result. Thanks to all. I pulled out the plug tonight as I scared the neighbors kid with a kaboom and it stopped being funny to me. They had glued it in place but one sharp tale back on the pliers with a small hammer and out she came. 1.5 back and the kaboom appears to be no more. Maybe no less, I guess time will tell. New Hampshire. 2003 SL650. 13k miles. Raptor installed. Versy adjuster. Rotella 6 w/zinc. Idle mix plug out. Seat front up 1". Owned since July 2013. Mechanically inclined. Better cook than mechanic. Idle Mix Screw Brass Plug removal SUCCESS! I just drilled out the cover to the Idle Mix adjusting screw..it was a lot easier than I expected. Why don't the dealers do this mod? It runs a lot better ,doesn't "pop" on gear changes but still does a dog fart when I shut it down. next I'll do some fine tuning Thanks for the info! Re: Idle Mix Screw Brass Plug removal SUCCESS! Most dealers won't tamper with adjustments related to exhaust emissions for legal reasons. It doesn't state the penalty.....but here is information that makes it clear you (including dealers) are not supposed to tamper with the emission controll devices. I would interpret this to mean jet changes and pulling out devices that are installed specifically so you don't make any changes. There may come a day when your bike is inspected and won't be licensed if you have (tampered with) removed the brass plug.....and maybe even tailpipe testing for emissions. KY did that for a little while in the Boon/Campbell/Kenton county areas for passenger cars and trucks - but they have abandoned it. Someday I will be old......But not today! equipped with a modified exhaust system that amplifies or increases the exhaust noise so it is louder than the noise made by the original exhaust system.Equipped with a muffler intentionally designed to allow for the internal baffling to be fully or partially removed or interchangeable (1979 and newer motorcycles). If that one was enforced there would hardly be a Harley in the state with a legal inspection sticker or registration. 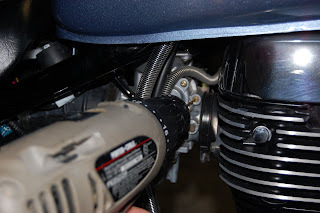 In fact most Harley dealers are more than happy to sell you a six or seven hundred dollar set of pipes for your brand new bike, charge you another hundred or so to remap the fuel injection, slap on an inspection sticker and send you out the door. I'm not complaining about this - I think you should be able to do whatever you want to your motorcycle - but I do find it a bit ironic. I've got two 1/2 inch holes drilled in the end of my muffler courtesy of the previous owner, and the idle mixture plug is gone too. No one doing the yearly inspections has ever paid any attention. Off topic replies have been moved to this thread.